In William Greenway Russell's What I Know About Winchester, written in 1876, is a passing remark that James W. Burgess lived in an "eight square house built a few years ago." Close, but not quite. Russell's recollections made the common error of assuming the oddly-shaped house on the hill has eight sides instead of the actual number six. Perhaps if Mr. Russell had anticipated the rarity of such structures, he might have elaborated more on the subject. Then again, how could he guess Winchester would lay claim to Virginia's only hexagonal house two short years after it was constructed? The octagonal house - an eight-sided style promoted by Orson Squire Fowler to better utilize interior space and maximize the natural light - is rare, but the hexagonal form (six-sided) is rarer still. The style was introduced shortly before the Civil War in America and was practically forgotten afterwards . . . except by a certain James W. Burgess, who took a fancy to the plan. Local lore says the architect, Brice Leatherman, was given free rein to decorate the exterior with delicate scroll sawn brackets, an elaborate front porch, and frosted glass window panes, but the interior reflects a much more conservative approach with simple mantles and moldings. While natural light is abundant through the large and numerous windows, the interior space is challenging, with many nooks large enough to function only as closets. The house was originally constructed of yellow brick, but at some point the exterior was painted red and mortar joints were outlined in white. After PHW sold the property to the Glass-Glen Burnie Foundation, the exterior was painted the yellow you see today, bringing the house closer to its original appearance. The interior retains the original floors, fireplace grates, period appropriate light fixtures, and cast iron radiators. Overall, the house is in nearly the same condition as when Mr. Burgess conceived his plan for a hexagon house, and the building earned one of only seven "outstanding" ratings given in the 1976 architectural inventory of over one thousand buildings in Winchester's Historic District. The property is individually listed in the National Register. 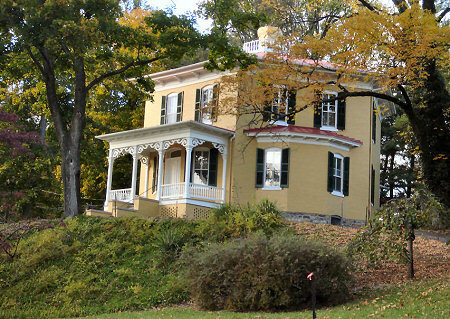 Today, the Hexagon House is owned and maintained by the Museum of the Shenandoah Valley, which provides PHW with complimentary office space.